Through the years there have been great innovations in the field of Ship Design and Naval Architecture, especially over the last century. Something which came up during this time was the introduction of Computer Aided Design and simulation, which has added a lot of flexibility to workflow. The Science of Naval Architecture owes a lot to learn from case studies and disasters. As is the case with Automobile Design and other similar disciplines, Naval Architects usually do not have the luxury of prototypes. However, this does not deter the efforts of some specialists who love to play with the particulars to achieve the best possible results. Some innovative ships thus developed broke the stereotypes in the design set by traditional ‘safe’ shipbuilding practices and brought an era where the best solutions are often offbeat ones. What would happen if you took a paper boat and let it float upside-down? It would continue to float. What if similar things were done with ships, only that they were constructed purposefully in such a manner? The result is that they would actually be feasible and efficient designs as is the case with the Zumwalt Class Destroyers of the US Navy. These vessels have a longer waterline as compared to a vessel of the same length having a conventional upright bow, this means they have greater hull speeds. The flare (you know, the outward curving of the hull plating above the waterline) at the fore end is also greatly reduced to almost non-existence in such designs, therefore reducing the risk of slamming. These hulls also cut down the fuel consumption as opposed to climbing over waves, they pierce through them. This action of the bow also reduces the water spray as the bow enters the water more ‘softly’, which means that there is less backflow from direct impact with the ship’s bow. These ships are highly manoeuvrable and handle quite well in rough seas. Another feature in this design is the return of the tumblehome which is the narrowing of the ship hull above the design waterline which had become a rarity in modern ship design as opposed to the flare. Do you find any similarities between these and the fore part of submarines (Look closely at the ones designed by Ulstein Group)? Usually, the to and fro motion of icebreakers is time-consuming, this prompted designers to come up with something new. The idea of this vessel called Baltika came into being, the asymmetrical hull shape which you might have seen in the picture allows the vessel to change its original waterline, allowing a larger sweep from the new icebreaking width. The speciality of the design lies in the use of a combination multiple azipods, specially fitted electronic equipment on an oblique Navigation Bridge which can function for both modes of motion. The first when it operates bow-stern aligned and second when operating obliquely astern to allow more ice clearance for wider vessels. The azipods make such demanding manoeuvres possible. The propeller pods are designed such that the ice breaks away totally before impact. This ship can also perform rescue and oil recovery operations. The latter aided by its unique orientation of motion as discussed above. This is indeed one of unique looking ship designs ever, with a superstructure resembling a chimney from some factory. 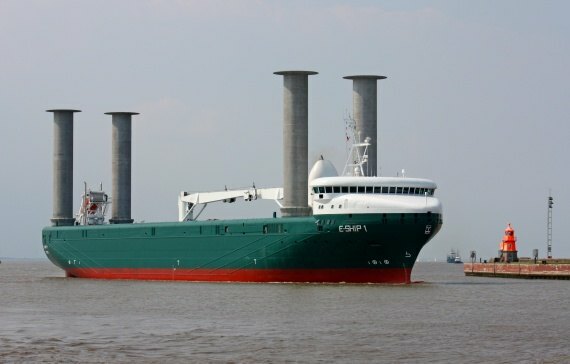 Actually, these ‘chimneys’ are not ‘chimneys’ are called Flettener Rotors being named after the gentleman named Anton Flettner, who first constructed the first rotor ships as early as the 1920’s. These ships use the famous Magnus effect to propel the ships, do you remember the famous banana kicks in football or the ball of the century in cricket? Well, the principle remains pretty much the same, here the pressure difference created on a spinning body (in this case, the Flettner Rotor) causes its displacement along the same, only here all the rotors aboard such ships are electronically manoeuvred by onboard wind sensing and control system which obviously cuts down on highly probable human errors. Also, you might question why these rotors have to be exceptionally high and exactly four in number? Well, here we have a situation where you are using air as the fluid medium to generate thrust, for a ship of this magnitude, the surface area required to generate usable thrust would then be quite enormous, precisely what these large Flettener Rotors offer. Also, the direction of the rotation in all four of these would obviously matter. This job as mentioned before is left to the onboard control system. Oil recovery vessels have often been an area where the designers have tried to optimise the area of collection of contaminated seawater by slight changes in propulsion machinery alignment. 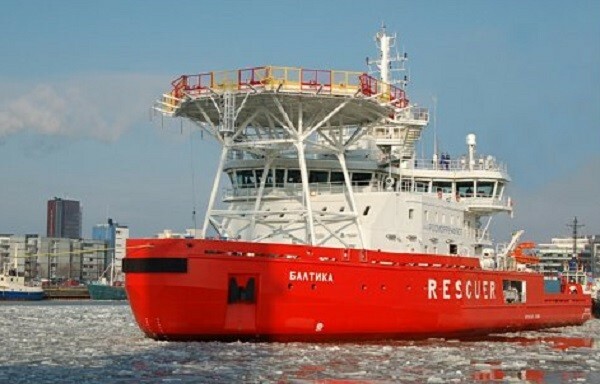 The icebreaker Baltika (above), which also doubles up as an oil recovery vessel, is an example of such a vessel. Now, here is a ship which literally ‘eats’ into the oil deposition from some oil spill and stores it into its recovery tanks. The ship currently owned by the German Navy has the ability to split along the length to allow a larger area for trapping the oil-contaminated water which is pumped into the tanks and here they are separated from the oil. This allows a lot of flexibility and saves a lot of time in the recovery process. However, this is only possible because of the twin hull concept which has greater transverse stability as compared to a single hull design which has a bow opening mechanism. To you, this ship might look like it has been sliced off from the midbody, actually, it wasn’t. Rather, it is another novel design which has its own unique benefits. 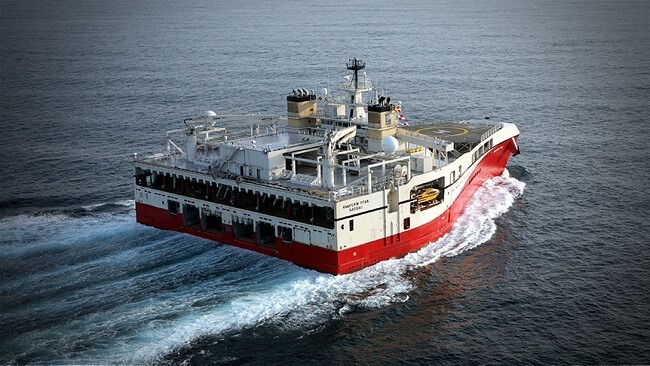 Intended to collect seismic data from the oceans, this ship has additional benefits in that it is able to deploy easily and has large accommodation and deck area and exceptionally large fuel capacity in comparison to vessels of the same length. The ship makes a waveform that is sinusoidal along its length. By the way, why would the designers be interested in the so-called sinusoidal waveform? You’ll come to know soon. The unusually large beam which you can easily notice at the aft part of the ship allows for greater initial stability and consequently a very large period of a roll which makes the ship a smoother sailing one, very crucial in carrying out seismic data acquisition operations. The large fuel capacity allows for long survey endurance lasting around 150 days. Remember, the ship features a sinusoidal wave formation along its length? Why? Time to know. Well, as you have already noticed the sudden discontinuity in the ship at its aft, you might as well be interested to know that this comes with a big disadvantage to the ship. The flow of water around the ship’s hull suddenly breaks as it reaches the aft. We designers call it flow separation, which leads to the formation of eddies. Now eddies are nothing, but water particles in circular turbulent motion, which in simple terms means, that the water particle has gained some energy. Where did this energy come from? From the power provided by the propeller, therefore causing a loss of propulsive efficiency of the ship. Wondering why the designers didn’t pay heed to this? Well, they designed the length and the hull form in such a way such that the wave formed by the ship is always sinusoidal along its waterline, which by the theory of hydrodynamics, induces minimum drag on the ship. 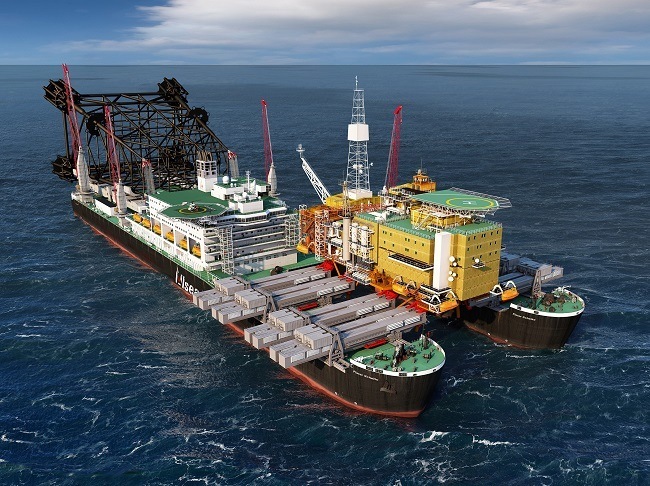 Conceptualized by the Allseas Company and already the contender for the ‘Biggest Ship in the world’, this is a “One of a kind in the world” vessel which is involved in lifting and replacing almost entire offshore platforms and often doubling up as a pipelay vessel, something which Bloomberg describes as ‘picking a 48,000-ton flower’. The topside is lifted on the decks which look like two fingers at the bow. This process uses simple buoyancy maneuvers and hence you really don’t need to know every bit of weight and C.G. of the platform. The jacket of a platform is carried on the stern, now both parts may now be transported to other places or brought to the shore for dismantling, or simply ‘delivering’ such platforms in the first place. Today this is capable doing such things for 95% of the world’s existing platforms, but the company hopes to upgrade it for all offshore platforms in existence today owing to its shallow draught. Besides, it is also an excellent pipe-lay vessel with a removable stinger to allow its other functions. Prelude FLNG is the world’s first floating liquefied natural gas platform as well as the largest offshore facility ever constructed. The Prelude is being built by Samsung Heavy Industries in South Korea for Royal Dutch Shell. It is 488 meters (1,601 ft) long, 74 meters (243 ft) wide, and made with more than 260,000 tonnes of steel. 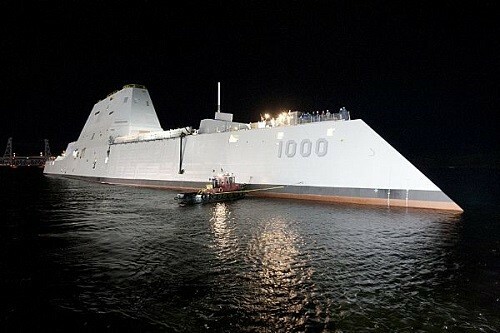 In operation, it would weigh more than 600,000 tonnes; more than five times the weight of the largest aircraft carrier. Prelude FLNG is the first deployment of Shell’s FLNG technology and will operate in a remote basin around 475 kilometers north-east of Broome, Western Australia for around 25 years. The facility will remain onsite during all weather events, having been designed to withstand a category 5 cyclone. 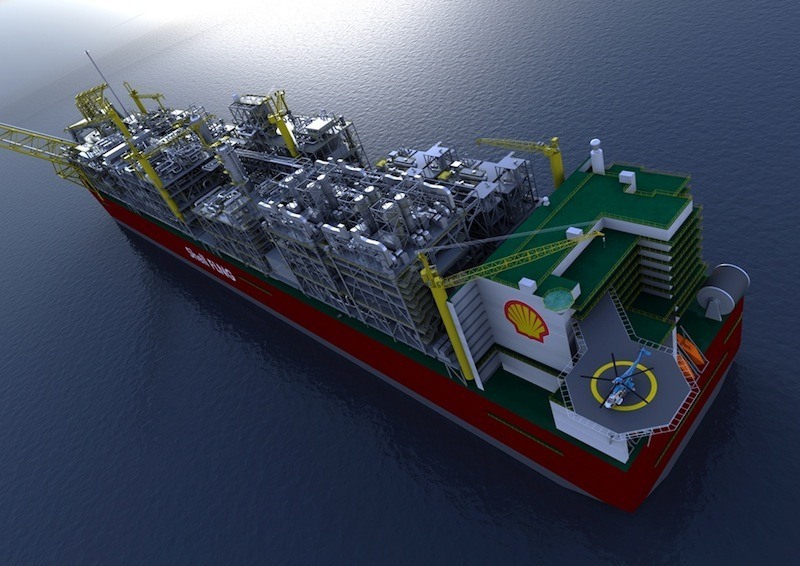 FLNG will allow Shell to produce natural gas at sea, turn it into liquefied natural gas and then transfer it directly to the ships that will transport it to customers. It will enable the development of gas resources ranging from clusters of smaller more remote fields to potentially larger fields via multiple facilities where, for a range of reasons, an onshore development is not viable. This can mean faster, cheaper, more flexible development and deployment strategies for resources that were previously uneconomic, or constrained by technical or other risks. What if someday ships could have movable superstructures? Which means the loading on board such a vessel has been optimised when tested to such an amount that when loaded, the superstructure’s positioning has little effect on structural strength or atleast, it (the still water bending moment) can be controlled to allow the vessel to be operated at required cargo set up. 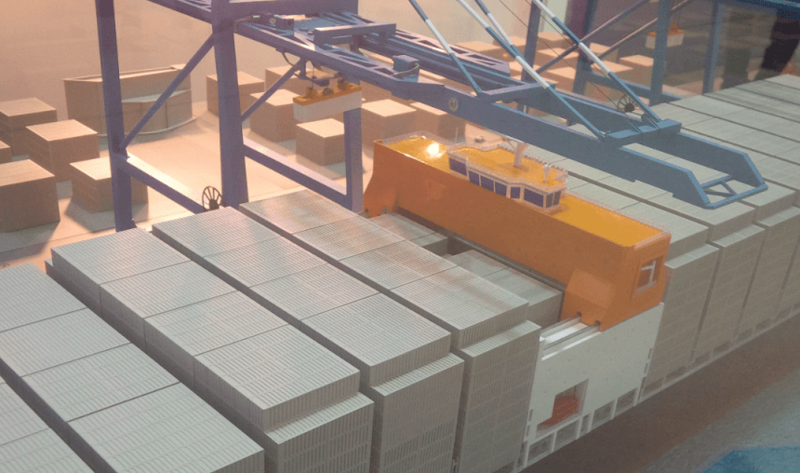 The people at Hyundai Heavy Industries analysed the stress distribution to every tiny bit and made certain modifications over traditional design (like adding insert plates) which gives you that extra tonnage on your Container ship. These will probably make their first appearances in Container ships and LNG Tankers where the excess size of their tanks will be compensated for. However, this project is still in the phase of concept design. Amazingly, this SkyBench can automatically detach from the supports as a last resort in the event of an emergency ensuring the crew are safe. This is not a newly built vessel, but the Flip Ship (Floating Instrument Platform) is a unique Research Ship created by the US Navy in collaboration with the Marine Physical Laboratory in the year 1962. It is designed like a spoon, stands at 355 ft and is unique in the sense that it has the flexibility to stand vertically from a routine ship’s position of being horizontal. The entire shift of the ship from its horizontal to vertical position takes around 28 minutes and it a sight worth beholding. By allowing water to seep into its ballast tanks, 300m of the ship is submerged in the water thus allowing the Flip Ship to carry out its purpose of being an accurate Research Ship. The main reason why this Research Ship is designed in this manner is because, generally the horizontal position of the ship does not allow accurate readings of waves and other oceanic data relevant because of the movement that a ship’s natural shape reduces the potency of the measuring devices. Apart from those mentioned above, we do know that there are several other types of ships that have raised the bar in the field of naval architecture and ships design. However, it would be difficult for us to mention each and every one.